Hundreds of cocktail recipes in your pocket for less than a cup of coffee. 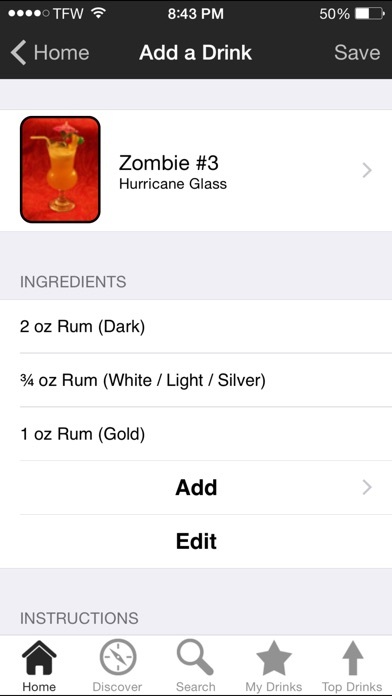 FEATURES - 'Backup & Restore' saves all iBartender user data to the cloud including custom drink recipes (with images), custom ingredients, favorites, ratings, and inventory selections (in-app purchase). - Recipes for many of the most popular mixed drinks, cocktails and shots. - 'Discover' shows you the drinks you can make with what you have on hand. - 'Shopping List' uses the ingredients you have on hand and your favorite drinks to create a shopping list of the ingredients you are missing (found under "My Drinks"). - Add your own drink recipes. - Add your own ingredients (found under Home -> Settings). 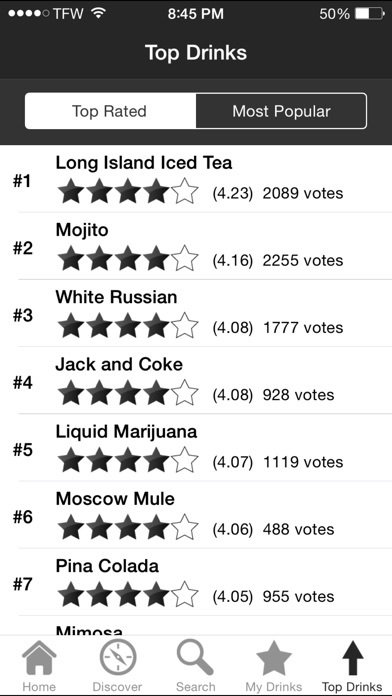 - Rate drinks and view the top rated & most popular drinks as determined by other iBartender users. - Quick partial name searching. - Images for one third of the drinks with more added each update. - View recipes in US standard or metric units. - Email drink recipes. 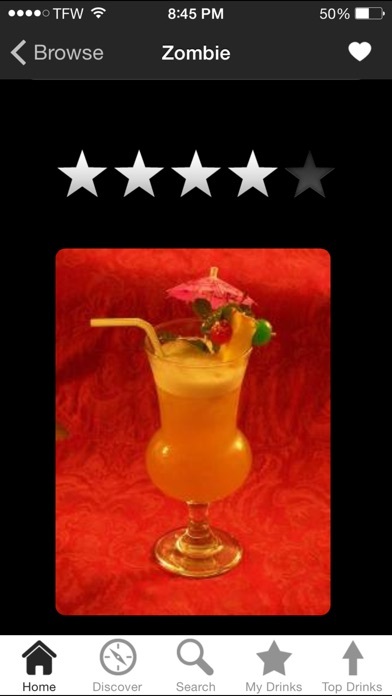 - Choose a random drink when browsing by shaking your iOS device. - Simple, easy to use interface. Please drink responsibly. My current favorite cocktail recipe app is abandonware so I’m looking for a new one. This one looked intriguing, with a small but enthusiastic set of reviews, and possibly robust set of recipes and custom user recipes. Unfortunately, as another reviewer noted, the recipes weren’t what I expected. And easy example: Lemon Drop. I expect it to use Absolute Citron or other lemon-infused vodka, some lemon juice, simple syrup and maybe an orange liqueur. The recipe here was straight vodka and a lot of lemon juice. From a previous developer response, they state they’re using classic, long accepted recipes. I believe them. That’s fine. But I’m looking for recipes that are generally similar to what’s broadly used in 2018. This discrepancy between what I expect and the library was across my favorite drinks. Additionally, the UI design is not attractive, to me. It’s not bad, but it’s not a delight. Especially compared to the old app I’m replacing, which is elegant and way to use. I decided that for me a kinda clunky app that I’d have to write all my core recipes anew wasn’t what I wanted. If this got tuned up, the recipes expanded to include contemporary approaches, and a UI refresh of the UI (see the sadly abandoned Old Sport for inspiration), I’d gladly pay a few bucks for it. This app is a good option to compare to the other freemium apps, which have their own pluses and minuses. Seriously. This app is that good. I now have most likely a little over a thousand drinks installed under Kevin’s app and would be devastated if support was dropped for it. Being a home bartender I’ve also found useful at out local bar for introducing custom drinks. 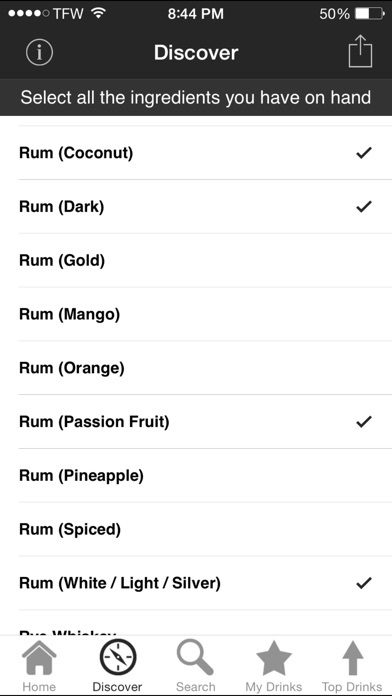 The things that really make this app shine is the ability to know which drinks you can make based on ingredients on hand and the fact you can add custom ingredients in order to add new drinks all the time. I have the app installed on both iPad and iPhone. Of all my apps, this is the one I treasure most as I have tons of hours (and fun) pouring over drinks on the web and adding them and the ingredients to this app. Oh, the new backup feature is a God send too! Perhaps the only thing I can think of is a print feature. And I think the only time I could see this really coming into play is if, and only if, support was dropped at least all the work put into adding custom drinks wouldn’t be lost. Anyways, super app and HIGHLY recommended. I would like to be able to enter a particular ingredient that is not on the list. I cannot create my own cocktail list if I have an item that is not in the drop down. It’s great that you can select the type of glass and the measurements but your stuck with items on the drop down list. Love the fact it gives you drinks you can make with what is on hand and can add custom ingredients and drinks. The only thing missing is: A list of ingredients that'll complete uncompleted recipes missing 1 ingredient. The feature with favorite drinks adding to the shopping list is near that point, but i'd like it for drinks I haven't favorited yet. The only other thing is that the random drink function would be great with the Drinks You Can Make list. It only works for the Browse All list. If it is supposed to work with Drinks You Can Make then maybe there's a bug because it does not work for me. Anyway, add those two features and its a 5 star app. Its very favorable compared to Liquor Cabinet, which is clunky for adding/altering recipes and adding ingredients, and has no random drink function, too. Maybe the look of the app can be a bit better too. But thats a nit picking. Search is useless in a hurry. Wrong. Wrong. Wrong. Just google your recipes. I want my money back. Feature only works if you type in the whole name. For instance if you're looking for Cosmopolitan you have to know how to spell it because if you type Cosmo it doesn't find cosmopolitan. Are you kidding me? This is a great app. The support is outstanding. You will be able to easily add custom drinks. You are also able to search for drinks based on what you have available. That is a really handy feature. There is a huge list of very tasty drinks which can easily be searched based on various criteria. 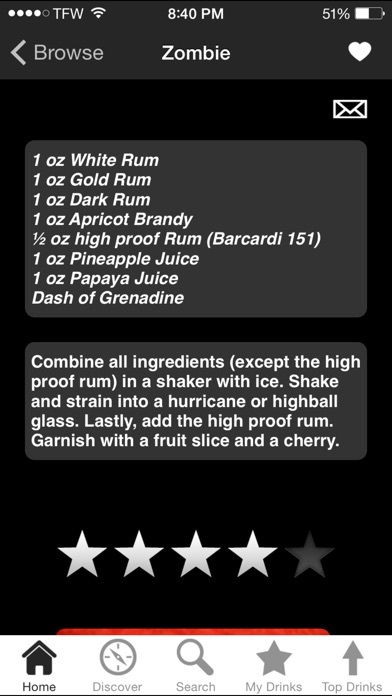 In my opinion, this is the only bartender app you'll need. The author of the app is also always making improvements and adding new drinks to the list. Why download another drink app when this one has it all. I just started bartending at this place that has quiet a few specialty drinks, and the hardest part is remembering the ingredients for each of these drinks. This app is really helping me accomplish that goal by allowing me to record the recipes and take photos of the finished product. I know this is going to be extremely handy when I'm in a jam and can't recall the recipe. Another benefit of this app is the ease of use to study the popular drinks as a refresher to stay sharp.